How can I increase the load capacity of this circuit? 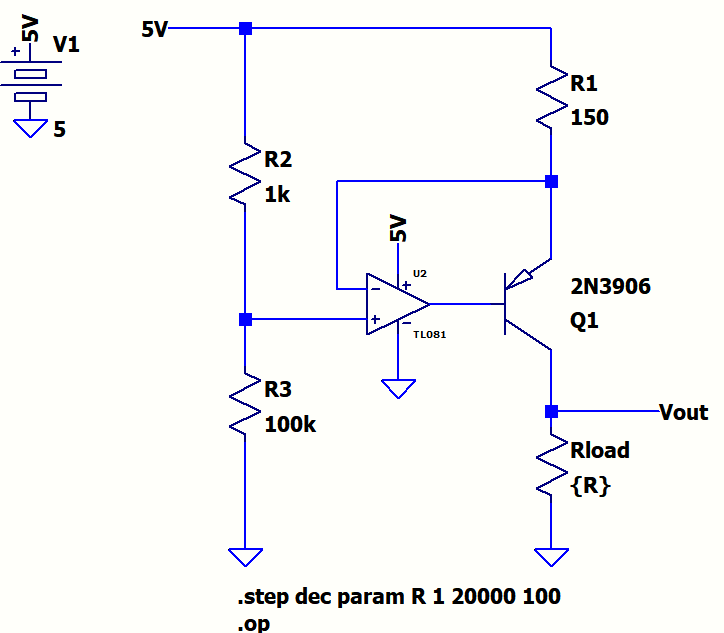 How can this circuit be modified to obtain the constant current source upto 20k? Reduce the current and/or increase the supply voltage. A quick calculation shows you that 5.5mA * 20k = 110V. That would be a bit hard to obtain with a 5V supply. The current is set by the voltage across. R1. 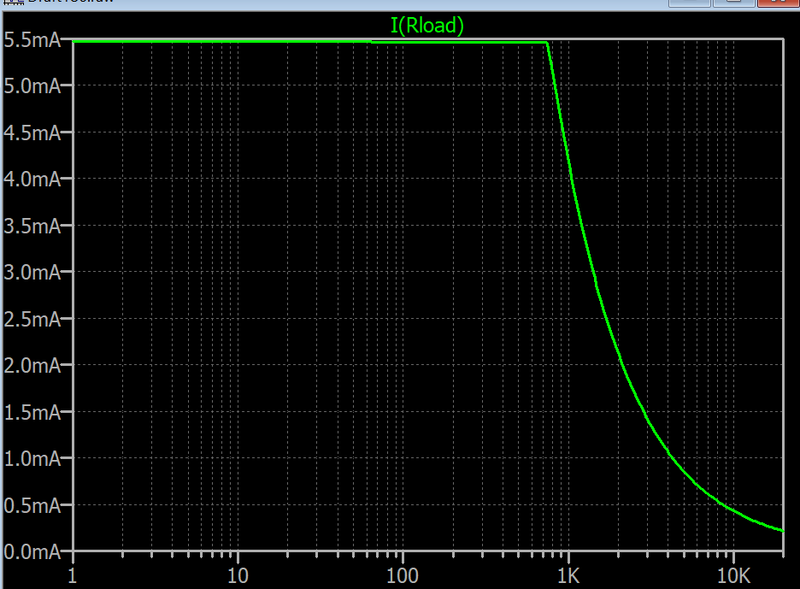 If you pass 5.5mA from a 1K ohm load, then Vout is 5.5mA * 1K =5.5volt, and circuit saturate before reaching this load. You need a supply voltage bigger than 100V, No opamp can handle this voltage and this circuit not works a for 20k load. Your circuit is not a good one, the TL081 has a large maximum offset voltage in comparison to the 49.5mV feedback signal and it is not guaranteed to work with Vin at the positive rail (though it will typically do so at room temperature). 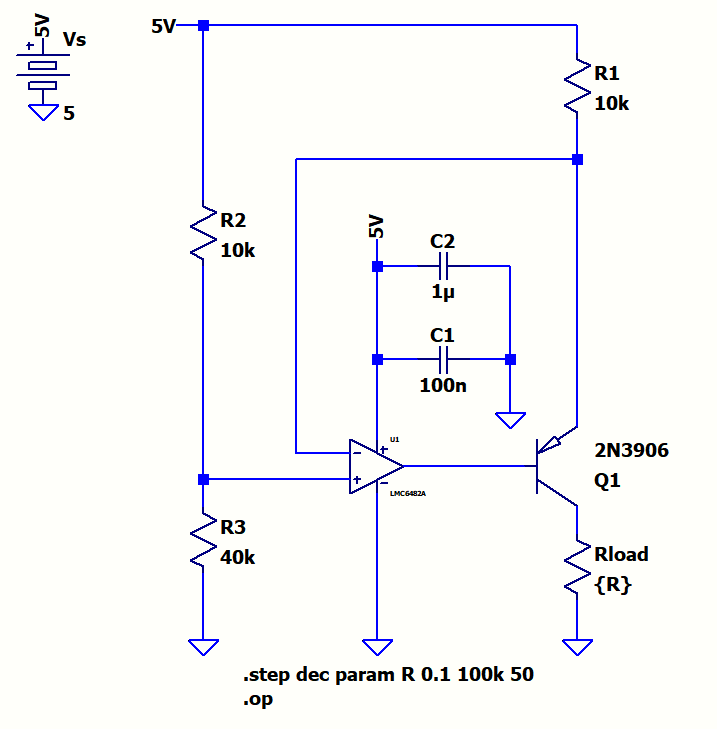 Better to use a rail-to-rail input/output op-amp with reasonable Vos. In any case, to decrease the current simply increase the emitter resistor to 49.5mV/Iout. So 249\$\Omega\$ will give you about 200uA. You might have to divide the base voltage to the positive rail because the output is certainly not guaranteed to swing close enough to the positive supply to turn the transistor off. But if you use a rail-to-rail I/O op-amp it will work fine. TL272 is not a rail-to-rail op-amp either. MCP6001 would be one (of many) possible choices, but I would suggest increasing R2 to 4.99K and R1 to 1.18K to reduce the Vos effect. Not the answer you're looking for? Browse other questions tagged operational-amplifier current-source or ask your own question. What is wrong with this butterworth filter, how can it be improved? How would one go about finding the Norton equivalent current for this? How does the resistor at the tail act as a current source in a differential pair? Is Joule Thief a constant current source?